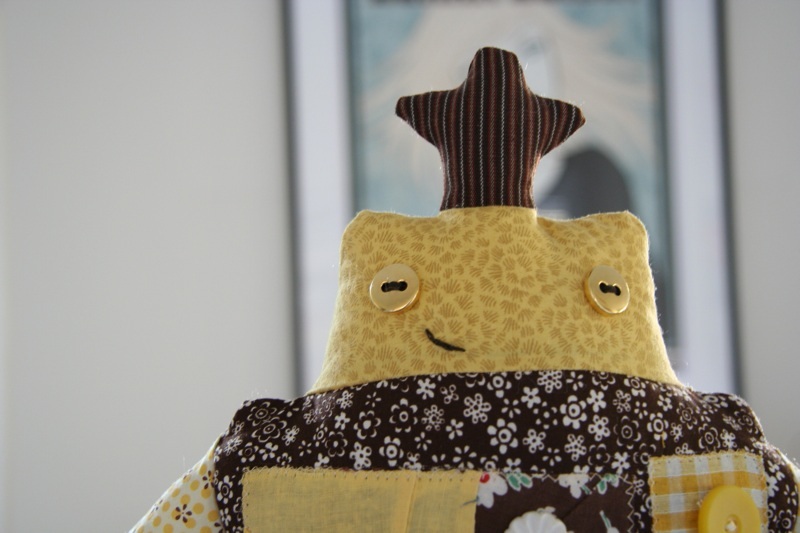 I had the idea of making a robot in the same was as my dolls and while I don’t want to play robot favorites, this guy is making me very happy because he’s so squishy and huggable. The patchwork panels on his chest and the stripes on his arms are from a quilt block Amy sent me a while back. I just love brown and yellow together. These fabrics were very close to becoming a Patchwork Set girl. Instead they filled a more technical destiny in the exciting world of robotics! oh, let me be the first to comment here and say the patchwork is working on this here robot. But you know this already! That’s why they call you wee wonderfuls! oooh, he’s marvelous!!! love the patchwork and the colors, but I really love his antenna. I’m partial to the buttons and his little claw hands. He’s so cool. Another great, creative idea and excellent workwomanship. 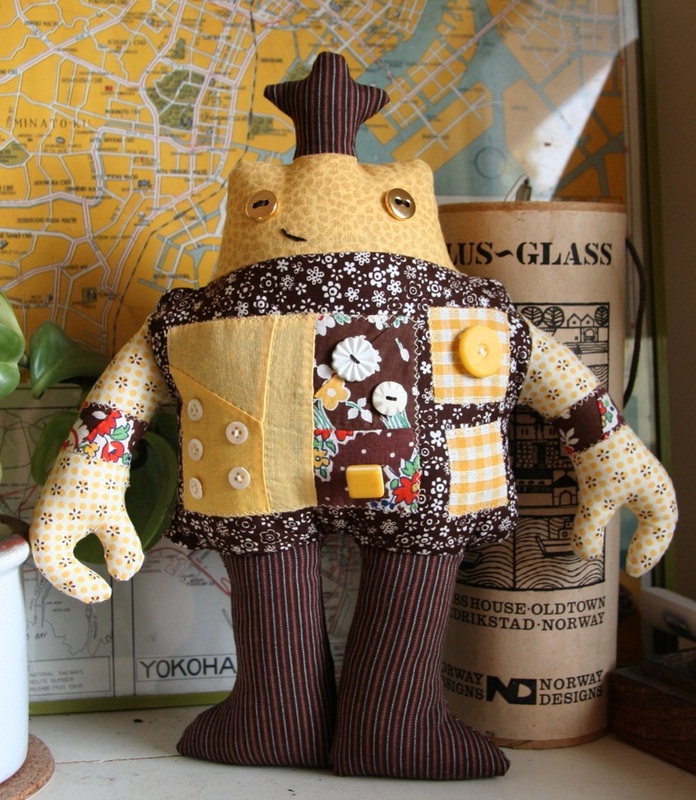 Your patchwork robot rocks! He is AWESOME! My son is suddenly very into robots, so I’m really clued into them and appreciate them these days. This guy is absolutely wonderful and I love every detail! As usual, your work is superb. Is this one for Morphe? Super cute, as always! I like the claw hands too! He looks like such a happy robot. holy moly i love him! This robot looks so mighty and happy! He’s a perfect robot for little’uns. Or me. I would love to cuddle him every night and day. I would love him and nap with him and whisper secret secrets in his ear. I love it! He looks very please with himself. Oh, he’s lovely! I love his claw hands, so clever! I love how you made this robot fit right in with your dolls! He looks as if he’ll fit right in! I love the patchwork, the colour combination, the smile,.. everything ! He’s like a robotic James Bond. I have that japan map poster !!!!!! Hum. I might sound crazy cos I don’t think I’ve commented before- I’ve been watching your blog for quite some time! Adorable!!!! Makes me want to try one myself! I love him!! I want to know more about him. like his mission? and I LOVE his pincers(claw hands)and that second photo is soooo good. they all are, but that one is my fave. ack! i can’t get enough of his hads. so great and pinchy! the hands, the stitching on the arms, the button controls. none of it goes unnoticed. superb. OMIGOD! I LOVE HIM I WANT HIM! The smile! The hokeyness yet coolness! That is the coolest robot I have ever seen!! You are so creative…. Oh! He reminds me of something from the Beatles! Yellow Submarine! Wow, he’s so wonderful…I would pay almost anything for this!! Great idea to use the block, has me thinking about the pile of quilt block I have. Great site and wonderful talent you have. Great colors! I love his face. I love this high-tech object made of old-fashioned materials. I love that he has a slightly menacing posture, but that sly and sweet wee wonderfuls smile. As usual, you have thought out every detail. My favorite of your robots! He is so adorable!!!! Just heartmelting!!!! This is one of the most adorable things I’ve ever seen! I so want one! i like how it looks like he is sort of standing in third position. Guess I am passing along my geekiness quite nicely. I’m DEFINITELY getting this pattern. I have a swap it’ll be rockin for.